Bad during Day. Good during Night. High Latency Spikes, Jitter, Ping Problems, etc. After burning my fingers on Tikona (their dialer kept disconnecting a lot), BSNL (non-existent customer-service) i went back to You Broadband. I am on the slightly-expensive Rs. 1200 12 Mbps Hurricane Plan in Surat (upto 12 Mbps for 25 GB, then 1 Mbps unlimited). But it is vastly-useless during the day. Ping spikes from 50-400 during the day. During the night the latency/ping gets stable. The obvious reason is that during the day they have a huge load of users which disappears during the night (service start to improve after 6-7 PM). Not only does online gaming suffer, but even YouTube and other streaming videos take time to load. YouTube sometimes shifts the video to 240p for my so-called 12 Mbps connection (because of the ping spike i guess and not because of download speed). Many times pages need to be reloaded because the browser displays "connection reset" messages. It is pointless to complain to their customer care, because it seems they have vastly oversubscribed their network (i.e. added many more customers than their available bandwidth can support) and it is not a problem they can correct. Only the company management can correct this kind of cheating. And their customer care is actually better than that of others. They at least take calls fast. Though their standard reply after 1-2 days is an SMS that says "your problem has been resolved" even though nothing changes. 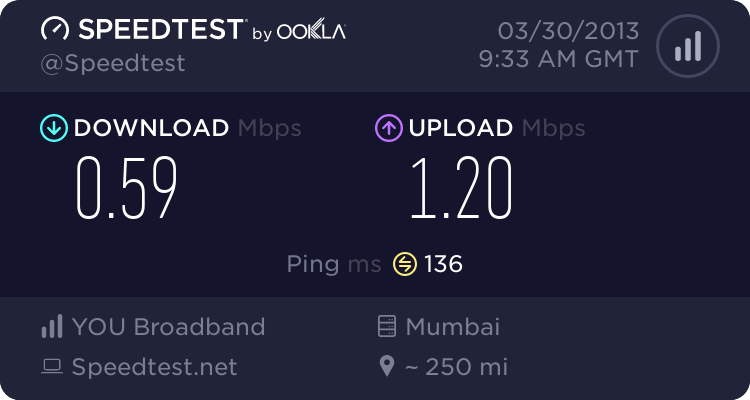 I'm thinking of shifting back to Tikona, they have a decent 1 Mbps plan for Rs 800 and i remember their latency/ping used to be around 80 and was stable around that number. Here are today's Speed & Ping Test results for You Broadband (day time 2 PM) - Most of the time during the day the connection is so bad that SpeedTest.net does not even load (configuration load error). As you can see from the above tests, download speed is ok, but the jitter is really bad, this means streaming videos will get stuck, take time to load, online games will lag, there will be delay, etc. I'm really sick of this, this has been going on for the past 3 months, at the end of each month i make up my mind to change the ISP but due to lack of any worthy competitor i keep ending up renewing the stupid connection. At least in the night i get a stable 12 Mbps connection. Last edited by Admin; 29th August 2014 at 08:19 AM. 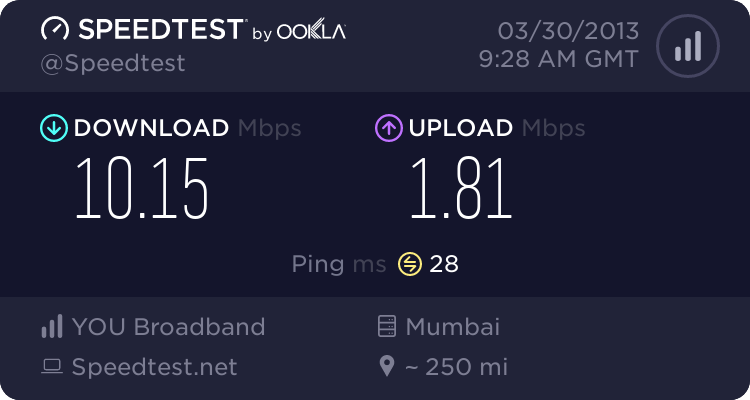 Latency from any where in India on a wired connection (except North Eastern states) should be way less then 50ms. There is something seriously wrong with the way your ISP routes their traffic. 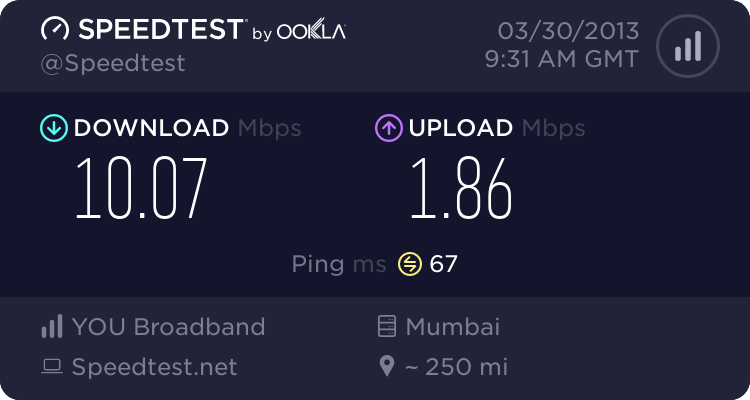 I would be worried even if I got those results on a wireless 3G connection for a Mumbai server. The problem however is that there is not much we can do as a customer. Such complaints wont heed any results because 95% of internet users have no problem with higher latency and probably dont even know what it means for their browsing experience. Gamers are the ones who benefit a lot with lower latency. High Ping/Latency, Packet Losses, Spikes ! I got high ping problems when playing multiplayer games,pls help!!! All times are GMT +5. The time now is 09:50 AM.